Must-Do Starter/Relay Mod for the S30 Z! When you start your Z do you get a clicking noise coming from your starter but the car doesn’t start? This is the simple mod that will fix that. The clicking noise is from the starter activating but not getting enough juice to spin. This can be from old wires or corroded connections. The Z’s used the ignition switch to activate the solenoid for the starter. 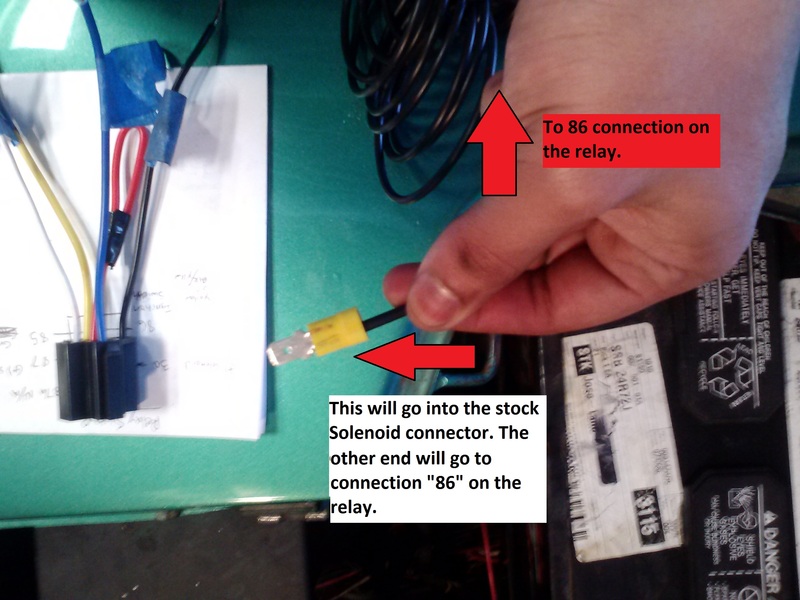 Using the relay mod will ensure that the solenoid gets a solid 12v every time the key is turned. I found this mod on XENONS30(John Walker) and I give him credit for most of the thinking on this project. Check out his site.This mod can be done for less than $5. Besides the relay, I had most of the materials laying around. The centerpiece of this mod is a 4 or 5 prong relay. I bought a pack of 5 30/40 amp 5 prong relays off of eBay. 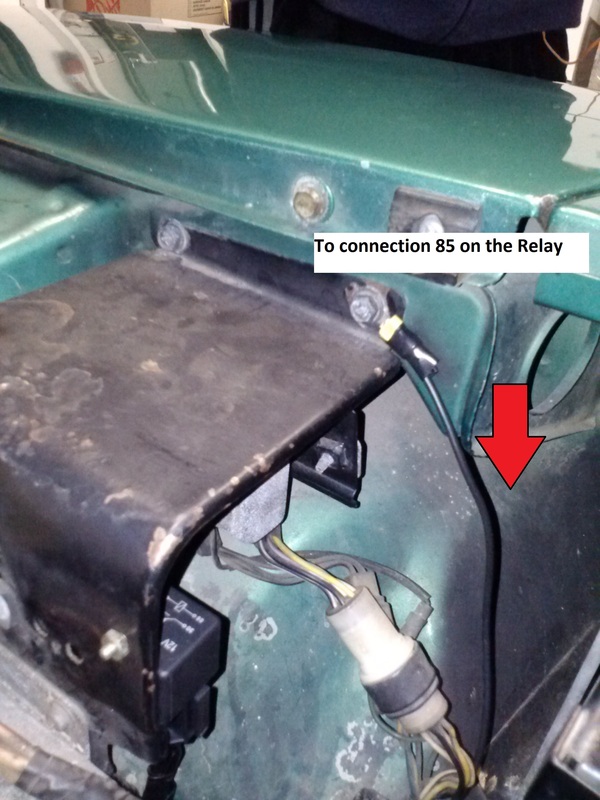 Find a good mounting place for the relay. Run a 14 gauge wire from the (+) side of the battery to the “87” connection on the relay. 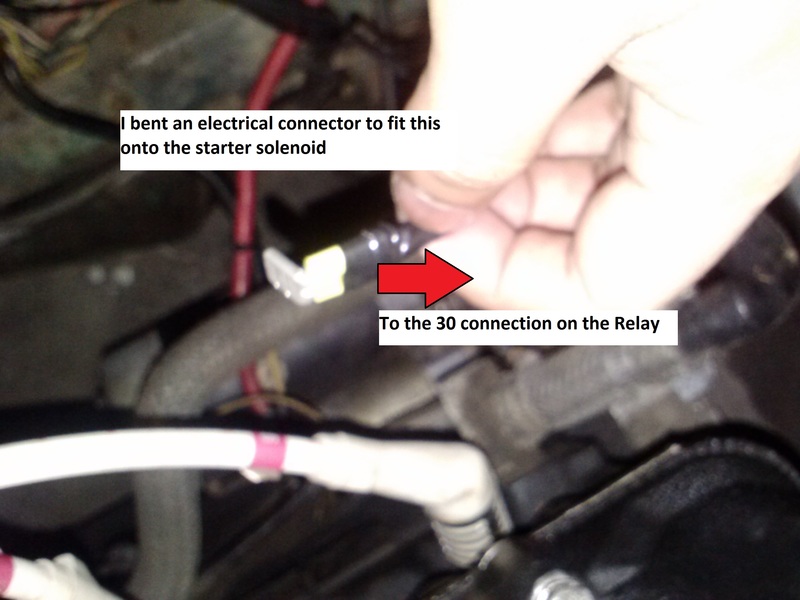 Run a 14 gauge wire from the solenoid to the “30” connection on the relay. Run a 14 gauge wire from the wire that originally was connected to the solenoid to the “86” connection on the relay. This wire is to the ignition switch. Finally, run a 14 gauge wire from the “85” connection to a good ground. Tidy things up. Re-connect your battery and start it up! This mod has been great for me. The Z started up instantly and has been doing so since I did this mod! I have a showroom 75 280z and over the past year starting has become very difficult. Keep in mind this is every nut and bolt resto with a complete mechanical & engine rebuild only 12,000 miles ago. The clicking from the solenoid continue to get louder and more often. 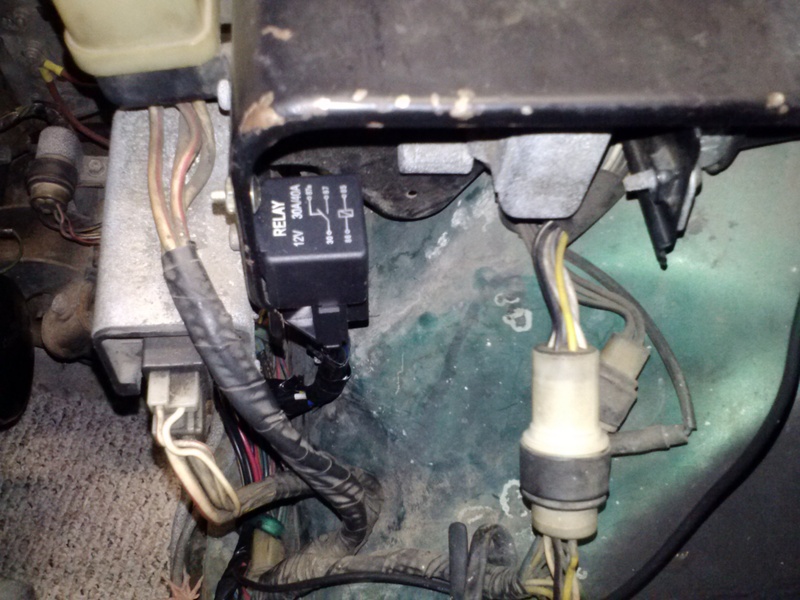 I started w replacing the solenoid but no good, I then found info on some of the forums on replacing the ignition relay, and after a few hours taking that out and testing it, no luck and problem was still there until I stumbled across your site on a Google search. This was simple and worked fantastic, with completely fixing the problem. Total cost $9. 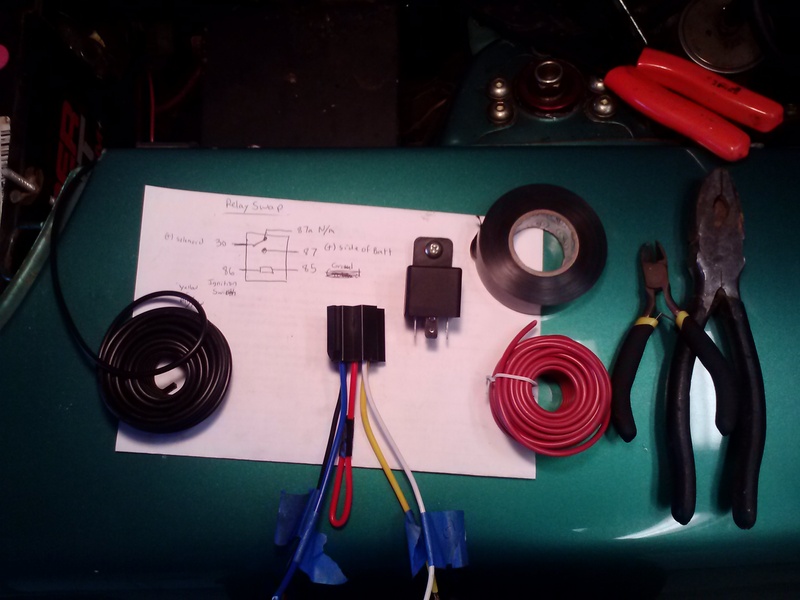 The only thing I will add is I purchased a sealed relay and a generic harness that had 10″ leads to easily install. I used shrink tubing to give it a clean effect as well as mounted it behind and under the edge of the plate you show in your picture. Thank you for posting and having this information available. Glad to hear it helped out! I was having similar problems. Mostly the car needed so many turns of the key in order to activate the starter. the new relay circuit helped alot, but also, I eventually added a push button start as well. thanks for checking out the site! 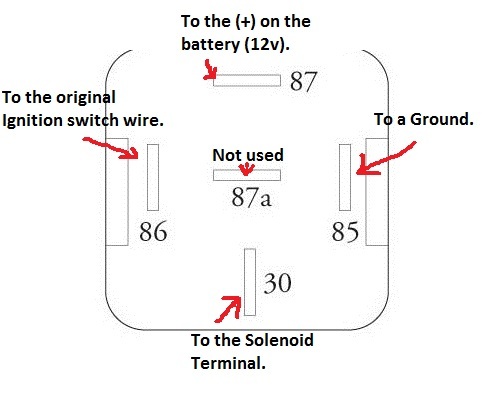 On the last photo it says “this wire is to connection 87 on the relay” that is the wire with the bent connector that in the previous image you said “goes to connection 30” on the relay. So where does it go? Good Catch! Thank you. The bent connector goes to connectoin 30. Connection 87 is to a +12v source. 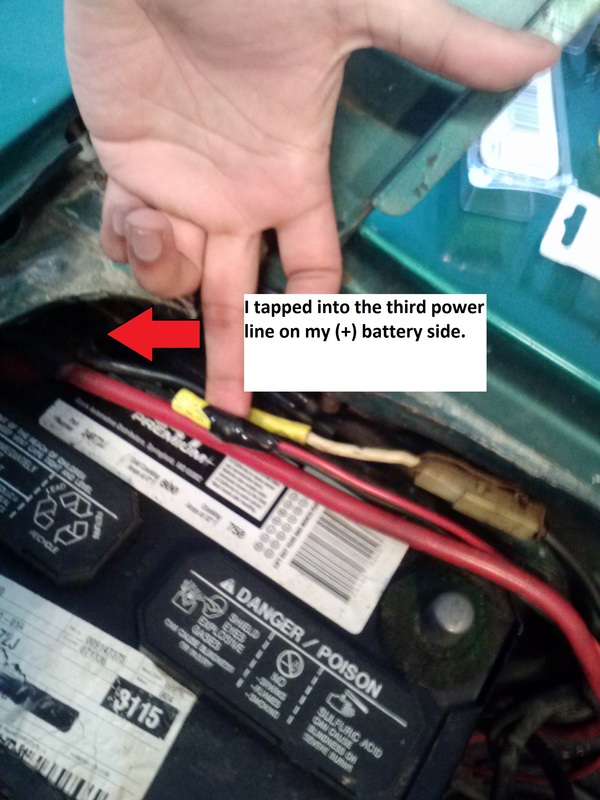 In this case I hooked mine directly to the (+) side of my battery.